Welcome to the North Hill Neighborhood, a centrally located neighborhood that includes nearly 5,000 homes. The neighborhood’s boundaries are Francis Avenue to the north, Ash Street to the west, Division Street to the east and Cora and Courtland Avenues to the south, along the bluff overlooking the city. The Neighborhood Council Program was created by city ordinance and the North Hill Neighborhood Council was officially recognized by the City of Spokane in March 1998 to operate in an advisory and advocacy role for our neighborhood. You can join the neighborhood council if you are at least 16 years of age and live in, own property in or operate a business within our boundaries. We seek and encourage participation from all individuals and groups in the neighborhood. The neighborhood council is a unique opportunity to have a voice and be heard at City Hall. We invite you to join us in exploring our issues, concerns, wants and needs for North Hill. The Nor th Hill Neighborhood Council meets most months on the second Thursday of each month at The Gathering House located at 733 West Garland Ave. The neighborhood has three elementary schools: Madison, Willard and Ridgeview and is also home to three public parks–Clark, Franklin and Ruth, a pocket park–that are busy and enjoyed by many of our neighbors. 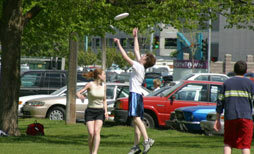 Throughout the summer Clark Park and Franklin Park host slow pitch softball games. 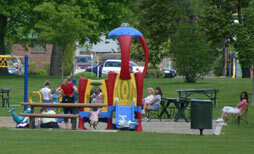 Franklin Park has many special events including “Bark in the Park” (a dog show), horseshoe tournaments, soccer games and a rally that the North Hill Neighborhood Council co-sponsors, “Neighbors United for Racial Equality.” It also includes a gazebo for large gatherings and recently upgraded playground equipment. There are more than six active churches in the neighborhood that make a big impact on our community. The architecture of the homes ranges from early 1900 Craftsman-style in the southern portion of the neighborhood to more contemporary homes and low-rise apartment buildings built throughout the 50s, 60s and 70s in the northern part of the neighborhood. The Garland Business District is a unique collection of retail stores, restaurants, the Spokane Art School and entertainment facilities. This area has served the neighborhood for over 70 years and hosts an annual Street Fair in the summer. 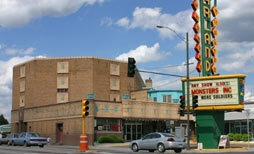 We have a wonderful movie house, the Garland Theater, that has all the neon of the 50s and has been recently refurbished. 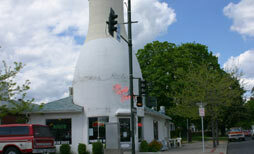 Just down the street is the Milk Bottle restaurant and ice cream parlor, built in the shape of its name. Along the northern corridor of the neighborhood are many professional and small business enterprises. The Division Street commercial area offers a variety of shopping options from cars to carpet, office supplies, furniture and casual dining. For information about the Neighborhood Council’s recent accomplishments please click on the Documents link.